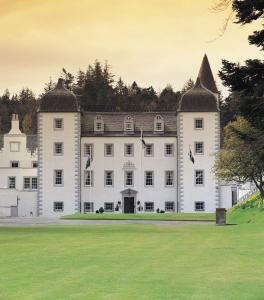 Choose from 657 hotels and guest houses in Scotland. Shown below a just a selection of the hotels available. To search within an area please use the menu on the right. Malmaison Edinburgh - The first ever Malmaison and still a vanguard of great style, great food and great value. Super chic rooms, every one different in shape and form, many with port views, all individually designed with great attention to detail, all with great beds, big beds, slinky lights, real bathrooms, cd players, cd libraries, cable tv, personal bars, vroom room service, interesting art, two line phones, data ports and exclusive toiletries. The art nouveau Brasserie and Bar serve real French cooking and fabulous wines in a traditional Brasserie buzz. We also have five dedicated, bespoke meeting rooms, tailored for business meetings, presentations or private parties. Gymtonic is our small state of the art gym exclusive to guests staying at Malmaison. Mackays Rooms And Restaurant - This small, modern retreat provides fantastic food and Highland chic near Cape Wrath and Sandwood Bay. Unwind, relax and enjoy the stylish home-from-home atmosphere. 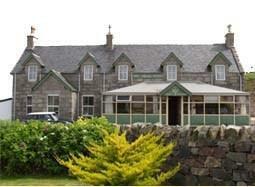 Mackays is a premier place to stay in the northwest corner of Scotland. There are 7 individually styled rooms and a small, intimate restaurant, Peatstacks. Many traditional Highland dishes, often difficult to find, are served. The menu changes daily and features top-quality food mad with fine local ingredients. Haymarket Hotel - Beautifully presented , privately owned and run city centre hotel made up of two fully modernised, charming, historical "B" listed Victorian town houses, where the emphasis is quality accommodation, impecable service, friendly attentive staff and good food. There are 25 well equiped, comfortable bedrooms, a city bar and lounge bar The Hotel is perfectly positioned for access to all visitor attractions, Edinburgh's financial district, the EICC and Murrayfield stadium making it ideal for the business or leisure visitor. The hotel does not have a lift. Express By Holiday Inn Glasgow Airport - Just 2 minutes' walk from the terminal building, and with covered walkway access and airport trolleys, this newly refurbished hotel offers air conditioned accommodation in a convenient location. 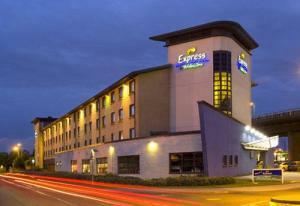 Express by Holiday Inn Glasgow Airport makes an early start or a late return easy. Whatever time your flight is, the hotel offers comfortable en suite accommodation at great rates. The quoted room rates include a free continental breakfast, which is available from 04:00, ensuring you can enjoy the most important meal of the day, even if you are taking one of the earliest flights. The convenient location also ensures that the hotel has great access to the area's major roads. Express by Holiday Inn Glasgow Airport is just off junction 28 of the M8 motorway, making it a great base for travellers, tourists and business visitors alike. 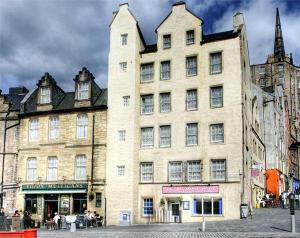 Grassmarket Hotel - The ideal base from which to discover all that Edinburgh has to offer, this budget hotel is situated within the historic Grassmarket area, only 2 minutes' walk from The Royal Mile. Adjoining the Irish themed Biddy Mulligans pub, the Grassmarket Hotel is set within a lively, social area filled with pubs, clubs, restaurants and speciality shops, which come to life in the evenings each night of the week. The en suite bedrooms are traditional in decor and located over 5 floors, with lift access. You can start each day with a full Scottish breakfast in Biddy Mulligans Pub. The Ayrshire and Galloway - Standing proudly within Ayr town centre, this hotel with free car parking and Wi-Fi is the place to stay whether on business or pleasure. Comfortably furnished and well-appointed, the Ayrshire and Galloway Hotel offers affordable rates, and nothing is overlooked. Guests can enjoy traditional fare in the Badge Bistro or opt for something with a Mediterranean twist from the Meridian Cafe Bar situated right next door. Enjoy a walk along the promenade, discover 'Rabbie Burn' country, horse racing, golf or just enjoy the pastimes in the surrounding areas. On the ground floor you will find the reception, the bistro and the Shire Bar. The Shire Bar is a warm, welcoming place where you can enjoy a hearty dram in front of an open fire. Hollytree Hotel and Swimming pool - Stunningly situated by the sea, this stylish hotel offers chic accommodation, facilities and dining. All 20 rooms enjoy magnificent sea views and all are fully en suite with luxurious fittings and furnishings, including their own seating areas. For informal dining, the bistro lounge serves great food and drink all day, every day, with an outside decking area on which to sit and enjoy the view of the water and passing yachts. In the evening visit the award-winning seafood restaurant, also with breathtaking views of the sea. Apex International Hotel - In the heart of Edinburgh's Grassmarket, the Apex International Hotel has striking views of Edinburgh Castle and provides an excellent base from which to explore Edinburgh city centre. 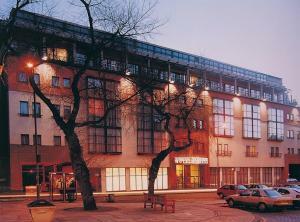 This 4-star contemporary hotel boasts luxurious leisure facilities, including a sauna, pool and gym. The Japanese-inspired leisure facilities feature fitness equipment from Technogym, as well as an ozone pool. Awarded 2 AA rosettes, Heights Restaurant on the rooftop serves imaginative fine cuisine, with the stunning backdrop of Edinburgh Castle. Metro Bar and Brasserie offers informal dining, overlooking the famous Grassmarket. All rooms are luxuriously furnished, with a widescreen TV, CD player and DVD player, luxury toiletries and a power shower. There is also free Wi-Fi internet access and 24-hour room service. The Apex International is centrally located in Edinburgh's Old Town, within walking distance of the Royal Mile and Lothian Road and 5 minutes' drive from Waverley Station. Aston Hotel - Dumfries - Located on the wonderful 100 acre Crichton Estate and adjacent to Easterbrook Hall and Conference Centre, Aston Hotel Dumfries blends state of the art facilities with traditional Scottish hospitality, with interiors creating an atmosphere of luxurious simplicity. The Crags Hotel - In the picturesque Scottish village of Callander, 10 miles northwest of Stirling, this small family-run Scottish inn offers clean, comfortable rooms and a traditional, old-fashioned Scottish pub. Whether you are on a tour of Scotland or looking to relax in an area of outstanding natural beauty, Callander is the perfect destination. 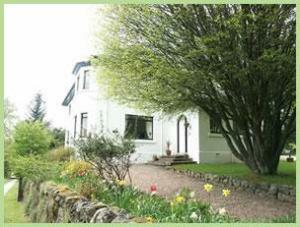 It is conveniently located in the heart of central Scotland, in the Loch Lomond and the Trossachs National Park. Callander is known as the gateway to the highlands and the town is within easy reach of some of Scotland's major attractions including Glen Coe, Loch Lomond, Glasgow, Edinburgh, Pitlochry and the Tay Valley. New top-of-the-range beds have been recently introduced in some of the rooms and certain areas of the hotel have undergone extensive renovation, including the dining room, the new snug bar and the family bedroom. The hotel also offers home-made food and a lively and friendly bar. Premier Inn Greenock - On the quayside, looking out over the waterfront, the hotel offers comfortable, great-value rooms and free parking, just off the A8 and less than 650 metres from Cartsdyke Railway Station. The Premier Inn Greenock has a convenient waterside location. The A8/M8 runs east into Glasgow and on to Edinburgh. The town's many train stations offer direct services to Glasgow Central Railway Station. The hotel has a 24-hour reception desk and some rooms can take 2 adults and up to 2 children (under 16 years). The 2 children also get a free full breakfast when accompanied by an adult eating a full breakfast. An all-you-can-eat buffet breakfast is available each morning and includes the expected cooked items such as scrambled, fried, poached or boiled eggs, and pork or vegetarian sausages. There is also a wide continental selection. The on-site Table Table restaurant offers a fresh new twist on eating out. The Pend - Enjoy friendly hospitality and good food at The Pend: a Georgian house offering luxurious guest accommodation in historic Dunkeld. The small hotel has 3 well-equipped bedrooms and a sitting room/dining area with a cosy fire. The menu offers the traditional cuisine of Perthshire and Scotland created with local ingredients from local suppliers. The hotel is recognised by Taste of Scotland. Dunkeld sits by the banks of the River Tay amid stunning scenery. It is about 12 miles (19.2 km) from Perth. Outdoor activities can be organised. 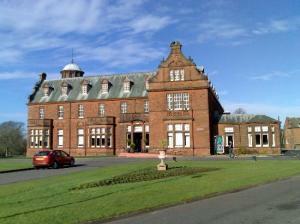 Guests can use the leisure club facilities of the nearby Hilton Dunkeld House Hotel at special discounted rates. In previous years, The Pend has won the Johansens 'Wine List of the Year' award and been selected as 'Best in Scotland' by both Which? Good Hotel Guide and Les Routiers. 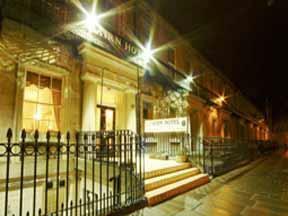 Cairn Hotel - Situated 5 minutes' walk from Princes Street and convenient for shops, theatres and nightlife, this budget non-smoking hotel is part of the Cairn group; ideal for holidays or business. Close to Edinburgh's Calton Hill, this city centre hotel is a fantastic place from which to explore the area and discover what goes on day and night. Especially when Carlton Hill, Princes Street and various gardens and parks are all close by. In addition, the Playhouse Theatre is only 5 minutes' walk away. The hotel is in an ideal location for the business and leisure traveller alike, situated close to the city and public transport routes. For those days when relaxation is preferred, the lounge with its plush armchairs, sofas and coffee tables, is the ideal place. Glenurquhart House Hotel - Nestled on a secluded wooded hillside, amid a 6 acre estate, this 3-star hotel boasts peace and tranquillity, complemented by spectacular views over Loch Meikle and Glen Urquhart. Opposite the hotel you will find the Glenurquhart forest and mountain bike trails. About 5 miles to the west is Cannich, which leads to the Glen Affric National Nature Reserve, where there are lovely walks through ancient Caledonian pinewoods and across open moorland, which provide the opportunity to enjoy all sorts of wildlife and unspoilt splendour. Also close by at Corrimony are Chambered Cairns and an RSPB bird reserve. In the evenings you can return to the comfort of the hotel and unwind in the residents' lounge with log fire, before sampling traditional Scottish food in the restaurant. Finish your night with a drink in the bar whilst planning your next day's activities. 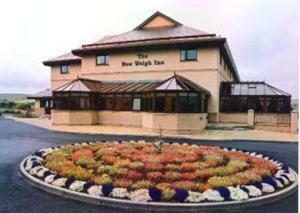 The Weigh Inn Hotel and Lodges - The Weigh Inn Hotel overlooks the Pentland Firth and has panoramic views of the Orkney Islands. The Orkney car ferry is 2 minutes away. The hotel is located on the outskirts of Thurso. It is close to the A9 to Scrabster Harbour, and the main road to the west coast of the Highlands. Bedrooms are located in the main hotel building and in lodges within the hotel grounds. Fresh, local food is served in the relaxed sports bar and 2 conservatories with excellent views. The Weigh Inn has 3 bars, and function and conference suites for up to 300 people. The Rowan Tree Country Hotel - When you choose to stay at The Rowan Tree Country Hotel, our aim is that you will enjoy your stay to the full. You can spend your day in and around the hotel, savouring the surroundings, strolling nearby or simply relaxing. The hotel benefits from views of the mountains to the East and the Loch to the West. 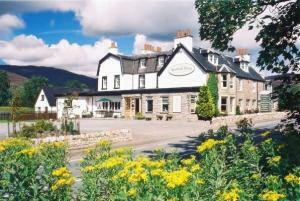 Although in tranquil surroundings, we are located on the outskirts of Aviemore and just minutes from the A9. The hotel - originally called The Lynwilg Mail and one of the oldest Inns in the Spey valley - was built in the 1700s as a coaching inn alongside the Great North Road. Extended in the mid-1800s, it rapidly established an excellent reputation and received honourable mentions in a number of diaries and accounts of the time. In its time, a part of the hotel has served as the village store, the post office and the local pub. Renamed The Rowan Tree in the early 90s, the hotel has been tastefully modernised and upgraded but always with an eye to retaining its essential character and features: timber beams, open fires and the stained-glass leaded window at the head of the splendid staircase. Heritage Hotel - Set within 2 elegant townhouses on an elevated Victorian terrace, this charming guest house is found in Glasgow's West End, just a short walk away from the city's underground system. Set in the artistic and cultural centre of Glasgow, the Heritage Hotel is just a short stroll away from Glasgow-Byres Road, which is lined with varied bars and bistros, and Great Western Road, with its magnificent homes and the Botanic Gardens. Easily accessible, the Heritage Hotel is also just a short walk away from the Kelvinbridge and Hillhead underground stations, allowing you to quickly reach central Glasgow and the surrounding areas. 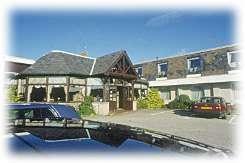 The Craighaar Hotel - The Craighaar is situated within easy reach of both Aberdeen Airport and Aberdeen City. Big enough to matter; small enough to care. The Craighaar Hotel's popularity with business and social guests is due in no small part to its fifty-five well-equipped en-suite bedrooms, six suites, attentive staff and quality cuisine served in relaxing surroundings. Guests therefore have the assurance that whatever their business or personal needs, the Craighaar Hotel is superbly equipped to cater for the widest variety of functions from business meetings and seminars to mini conferences and team building sessions. Socially, it's perfect for weddings, engagements and all manner of get-togethers. The George Hotel - The elegant, stylish and excellently located George Hotel is a chic base within easy reach of the Castle, Princes Street Gardens and Holyrood Palace. 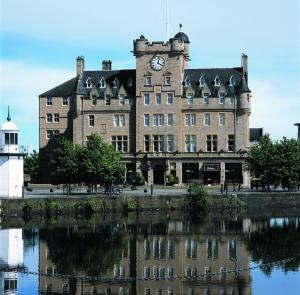 The 200-year-old hotel is a quick walk from Waverley Station and a short journey from Edinburgh International Airport. Each room has a state-of-the-art design and fine furnishings. Many have views of Edinburgh Castle or the Firth of Forth. The fashionable Tempus Restaurant offers relaxed, high-quality ? la carte dining and tempting Sunday lunches using tasty local produce. The vast cocktail menu and good-value champagnes take centre stage in the vibrant Tempus Bar. The George Hotel was voted 'Best Hotel in Edinburgh' at the Scottish Hotel Awards 2009. Seafield Lodge Hotel - Dating from 1879 and set in peaceful surroundings, this hotel offers modern facilities whilst retaining an old world charm. Set in the spectacular Highlands, the Seafield Lodge is one of Speyside's leading sporting hotels, catering for fishing, shooting and golfing enthusiasts, as well offering the perfect base for exploring Speyside, Royal Deeside, Loch Ness and touring the world famous Malt Whisky Trail. Mar Hall Hotel and Spa - This premier luxury hotel, found in a picturesque countryside setting near Glasgow, offers individually designed suites with breathtaking views of the Kilpatrick Hills. A range of dining options are offered, from The Cristal gourmet restaurant, to the Grand Hall that serves snacks all day. 7 meeting rooms accommodate from 2 to 120 people theatre style and, for larger events, the marquee holds up to 200. State-of-the-art audiovisual equipment is available, with a meeting executive on hand to ensure that your event is managed efficiently and professionally. The first Aveda Concept Spa in the U.K., influenced by the therapeutic traditions of India, offers a holistic approach to your well being. Using the finest oils, pure flower and plant essences, you will leave with body, mind and soul relaxed. The Edinburgh Residence - The Edinburgh Residence is a refreshing alternative to a 5-star hotel, where you will enjoy an experience to remember. A distinguished collection of 29 luxury town house suites, on offer is an incomparable level of space and luxury for business and leisure travellers to Edinburgh. 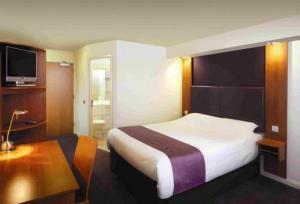 Selected suites in the hotel have recently been renovated to maintain a high standard of luxury accommodation. Invergarry Hotel - With a peaceful position overlooking the River Garry, this friendly hotel is an ideal base from which to explore the Scottish Highlands. Between Fort William and the Nevis Range, Inverness, the west coast and Skye, the Invergarry Hotel is based at the seat of the Ancient Clan Macdonnell. Built in 1885, the hotel was originally an old stagecoach inn. It has since been used as a sporting and shooting lodge before being transformed into a hotel, complete with residents' lounge and private gardens. Steeped in history and character, the hotel provides traditional Highland hospitality, welcoming log fires, fresh local food, real ales from the Isle of Skye and a large range of wines and Highland whiskies. 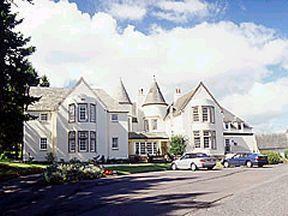 The Stakis Cairn Lodge Hotel - The Cairn Lodge Hotel is one of Perthshire's finest country house hotel and restaurants. We hope you soon experience at first hand our modern comforts, tranquil setting and superior quality cuisine. Neighbouring the World Famous Gleneagles Resort in the heart of beautiful Perthshire, Cairn Lodge Hotel & Restaurant is Perthshires Premier Country House. Boasting Four Star status and Two aa Red Rosette Food Awards, Cairn Lodge is a truly wonderful Country House specialising in fine food and wines with luxury accommodation for the discerning visitor. The Cairn Lodge is under private ownership of Mrs e Stakis Christie. We are official booking partners for all the Gleneagles Championship courses with guaranteed tee times and use of all the Gleneagles Resort facilities. Whether your next visit to Cairn Lodge be for a leisurely lunch, dinner in our restaurant, a romantic stay in one of our luxury rooms, a mid week or weekend break, a golfing or business trip, you can be assured of a very warm welcome and first class service from everyone at Cairn Lodge. Munro Inn - Munro Inn is in Queen Elizabeth Forest Park, next to Rob Roy Way. The comfy inn serves home-cooked food, has free Wi-Fi, and is an ideal base for walkers. 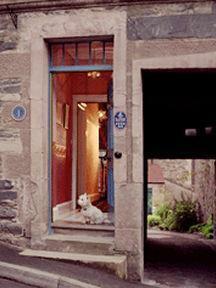 The traditional, dog-friendly inn is within the beautiful Trossachs, at the edge of the Highlands. It is 1 hour from Glasgow and 90 minutes from Edinburgh. The games room and library have a pool table, a 42-inch TV with Freeview and plenty of games and books. Munro inn serves home-cooked breakfasts, lunches, afternoon teas and dinners, from 08:00 until 22:00. 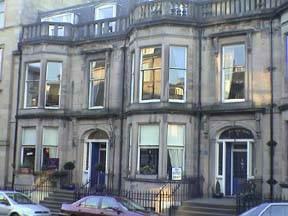 Manor Park Hotel - Situated in Glasgow's fashionable West End. A family run licensed hotel. The Hotel has been restored to its former glory offering personal service at affordable prices, with only a short distance to the Art Galleries, Universities, S.E.C.C., and Glasgow Airport, which is a 10 minute ride. If on business or pleasure the Manor Park Hotel is ideally situated for all sightseeing routes, and the motorway network, with 24 hour free parking guaranteed at the hotel. Inside is tastefully decorated to a very high standard throughout, offering daily maid service to the nine bedrooms. Gaelic is also spoken and advertised throughout the hotel, as Angus is from the Island of Eriskay. Speedbird Inn Aberdeen Airport - A lot of hard work and commitment has allowed Speedbird to establish itself as one of Aberdeen's leading hotels. 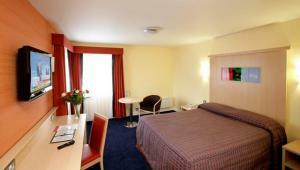 Our hotel offers outstanding quality and the best value at Aberdeen Airport. The Speedbird Inn pays careful attention to the smallest detail and has quickly made its mark to become one of Aberdeen's busiest. So whether it's a case of sleep inn, eat inn, or conference inn you'll always be 'inn good hands' with the team at Speedbird Inn. Whilst staying with us, why not sample our delicious food which is always freshly prepared under the supervision of our head chef John Duncan. Our conference facilities cater for up to 20 delegates, ensuring you of a successful meeting tailored exactly to your needs and your budget.